You can't beat the dog fences that are offered from Best Friend Fence. They are designed with strength, durability, affordability and the safety of your dog in mind. Our dog fences have satisfied the fencing needs of many happy customers and their pets with our quality design and dependability. It's a new wave solution to an age old problem of pet safety. It will keep your four legged friend in your sight, and out of trouble. You can use our dog fences to designate a specified area for your dog, or close off your entire backyard. The rolls of our dog fences come in different lengths and heights, depending on your individual needs. Our dog fences also come in different heights as well, depending on the size of your dog. 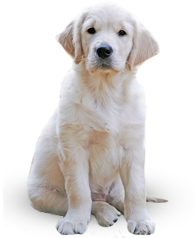 We offer a personalized dog fencing solution that will be the perfect option for you and your dog. A lot of people who own dogs choose to install our dog fences rather than the competition, because our dog fences are reliable. Dog owners are comfortable with our product and know that they are safe leaving their dogs in the designated area protected by Best Friend Fence's dog fences. Dog owners can now give their dogs the exercise they need by letting them roam freely without having to worry about them getting injured or escaping. Another great benefit of our dog fences is that not only will it keep your dog in a contained area, but it will also keep other animals out. Your dog will be safe from whatever is wandering through your yard. It will protect them from any stray animal that might be curious enough to try to make its way to your dog. No longer will inquisitive squirrels or even the neighbor's persistent dog have access to the area that you have specified for your dog. Your dog will be able to feel safe in their territory, with the help of the dog fences from Best Friend Fences. We are dedicated to giving you dog fences that are a humane and safe way to keep your dog from running away. We have found a fencing solution that is strong enough to prevent your dog from escaping it, but at the same won't be harsh and potentially injure your dog like more contemporary fencing solutions. Chain link fences can create sharp edges that can be a hazard for your dog. They also have a tendency to rust due to unfavorable weather. Rust can be horrible for your dog's well being, if they happen to ingest it. Or imagine what metal will do to your dog's teeth if they find a way to chew on the fencing. Chain link fences are easy to escape from, if your dog digs deep enough as well. Wooden fences are just as undependable. Wooden fences tend to rot and weaken as they get older, and as they suffer through the elements. In time, wooden fences will deteriorate, and start to splinter, and cause sharp edges that again, could potentially injure your dog. Also as pieces fall off of the fence, your dog could accidently ingest them, and pieces of wood are not on the list of healthy things for your dog to eat, we can assure you. They are also visually obstructive and take away from the aesthetic value of your yard and seclude you from the rest of the neighborhood. Not to mention they draw a lot of attention away from the beautiful landscaping that you have put hard work into. Dog fences from Best Friend Fence offer a better solution to these more contemporary fencing systems. Our dog fences are constructed of a very strong polypropylene composite that is extremely safe to use around animals. This composite is treated to be UV protectant and has anti-oxidants in it, to prevent rust, ultimately fortifying the strength of the fence. You won't have to worry about doing any maintenance on the fence, because it's designed to resist wear. It will hold strong for up to 20 years. The mesh design of our dog fences also prohibit your dog from being able to chew through it. The holes in the fencing are too small for dogs to get their teeth on, so not only will your dog's teeth will remain healthy; your dog fence will remain intact. It's also designed that when it is installed, your dog won't be able to dig underneath it, preventing subterranean escapes. Your dog won't be able to burrow its way to freedom any longer. You can be sure that your dog will always be in the last place you left it. The mesh is then fastened to steel posts with very durable zip ties, making the system very dependable. The installation process of our dog fences require minimal digging, and are simple to assemble. You won't need the help of a professional to protect your dog. Our kits make it very possible to do it yourself. 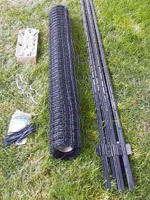 They come with everything you'll need to build our dog fences, including the rolls of mesh, steel posts, and fasteners. 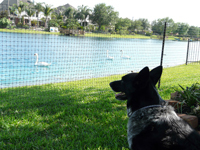 Dog fences from Best Friend Fence also don't obstruct the natural beauty of your yard. The mesh fencing is designed to be virtually invisible from over 20 feet away. Your neighbors will have no complaints about your new dog fence from Best Friend Fence; they might not even notice that it's there! You will also be able to see your dog clearly, so you won't have to worry about what they are doing behind the fence. You will always be able to see your dog, no matter where they are. The fence can also be altered depending on your individual needs. If your dog is a little more rambunctious, added supports can be attached to the fence to make it stronger. We also offer nylon tension cables that can be added to our dog fences that will increase their strength and reduce sagging, and also eliminate low spots on the fence that your dog could jump over. Our customizable dog fences will fit your needs, and more importantly your budget.